Today we’ll review one of the single best pieces of economic / political / social analysis I’ve been lucky enough to see. Read this post and you’ll have an extremely important input for how the world will proceed over the next eleven years. How can I make such a statement? Because this analysis landed on my screen in December, 2007, and it covered the time period from 1995 through 2024, and it has been working extremely well. I promised more about cycles. This is from the world of cycles. Understand this analysis and you will understand what Ben Bernanke of the US Federal Reserve has publicly admitted has been befuddling him and his colleagues. To put it mildly, an awful lot of people would have benefited if they had known about this huge switch that did occur, just as predicted, in January 2008. It really was as if, at the end of 2007, someone threw a big switch and changed things dramatically. Central bankers and politicians around the world are still scratching their collective balding heads about why all of the things they used to do in the past, things that would work to stimulate economies, are barely working today. At first they used their old tried-and-true methods–lowering interest rates, feigning confidence, stuffing cash into the banks, spending money on stimulus plans–and they got an anemic recovery at best. So they pulled out the really big guns. “Unconventional” methods, as they call them. Also known collectively as printing money. Lots of it. Enough since 2009 that they have basically tried to add the equivalent of one year of the US economy to the global economy. What has it got them? Well, since the printed money went into buying assets rather than creating jobs, the rich and their vendors–Sotheby’s, Porsche, Armani, et al–have done very well. Everyone else, not so well. The huge divide between rich and poor is widening at an accelerating pace. Historically, that has always been a dangerous setup. You can only push people so far before they push back. Sometimes fiercely. Overall, what it got them was continuing recession and debt crises in Europe, a US economy with paltry growth at best, and China joined the club of getting themselves over-indebted to keep their economy growing, but now that excess of debt is coming back to bite them and their economy is rapidly losing steam. Japan remains in near-continuous recession no matter what they do. Since the analysis above has been working remarkably well for 18 years, it makes a whole lot of sense to figure that it will keep working for the next eleven years. That was the claim for this cycle, that it would have two phases, one from 1995 through 2007, and the second, radically different in tone, from 2008 through 2024. 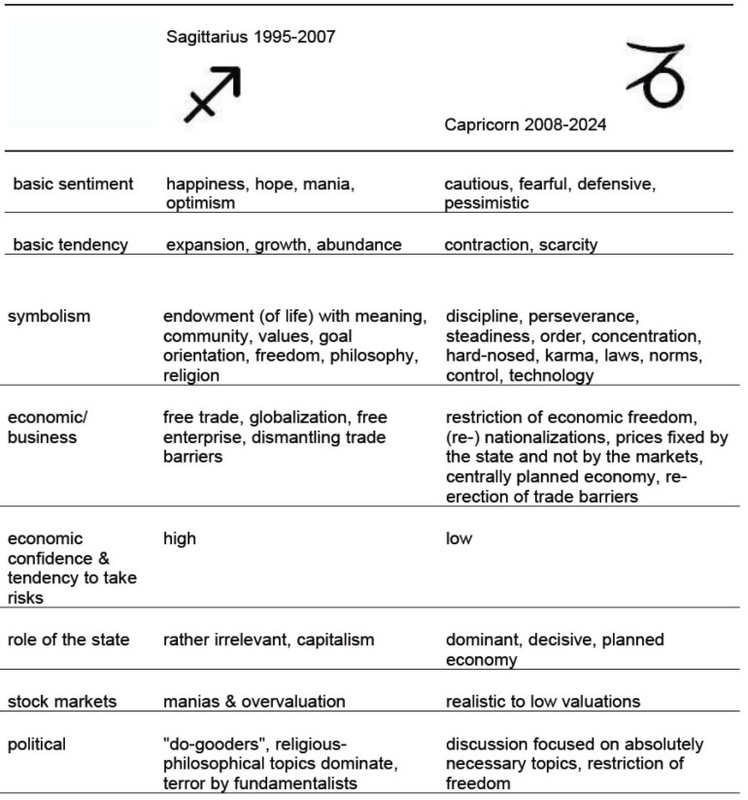 The table was astrological in nature. It showed what was about to happen as Pluto moved from Sagittarius into Capricorn. 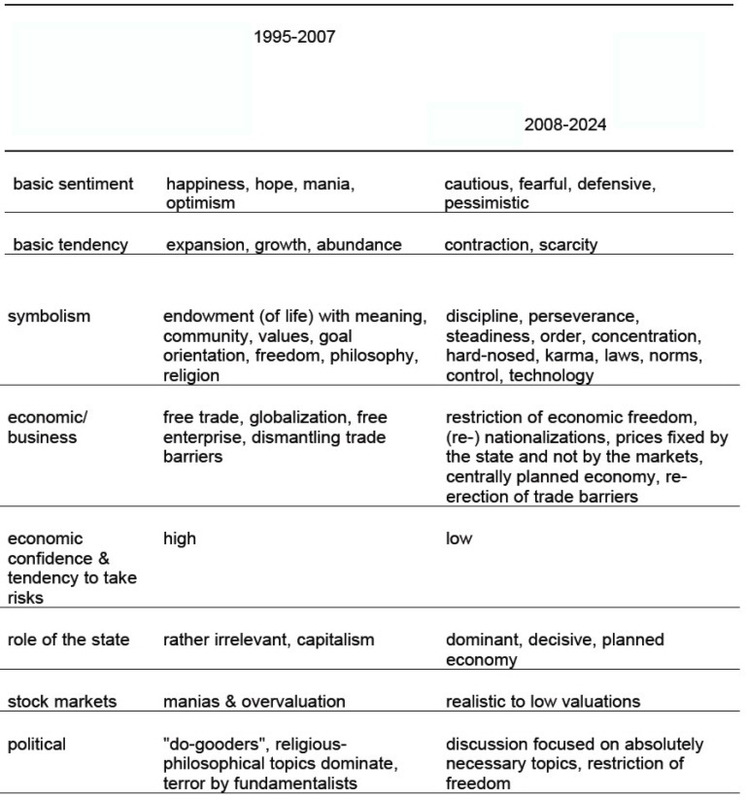 This outstanding piece of analysis was put forth by Manfred Zimmel through his web site in his Forecast Issue for the year 2008. At the web site, you can sign up for his free newsletter or paid subscription service. The information above was given to his paid subscribers only. 7/16/08 — [Fannie Mae and Freddie Mac are] adequately capitalized. They are in no danger of failing… [However,] the weakness in market confidence is having real effects as their stock prices fall, and it’s difficult for them to raise capital. WRONG, they needed bailouts to the tune of $160 billion. INTERVIEWER: Tell me, what is the worst-case scenario? We have so many economists coming on our air saying ‘Oh, this is a bubble, and it’s going to burst, and this is going to be a real issue for the economy.’ Some say it could even cause a recession at some point. What is the worst-case scenario if in fact we were to see prices come down substantially across the country? BERNANKE: Well, I guess I don’t buy your premise. It’s a pretty unlikely possibility. We’ve never had a decline in house prices on a nationwide basis. So, what I think is more likely is that house prices will slow, maybe stabilize, might slow consumption spending a bit. I don’t think it’s gonna drive the economy too far from its full employment path, though. So, acting on the Fed’s research can be very helpful. Acting on their opinions and forecasts is a mistake. They aren’t trying to help you, they are trying to help the banks. Anyone who understands that distinction can put Fed forecasts in the proper perspective. So the next time you hear rosy predictions about the great recovery that is turning out to be perennially “just around the corner,” whether those predictions are from someone who is mistaken or someone with malevolent intent, now you can understand that what these forecasters are up against is this: for an economy based on debt to grow, they need to get people to borrow more money. And until 2024, people are under the influence of Pluto in Capricorn, and most of them don’t really want to take on more debt. Quite the contrary, a lot of them have replaced the notion of “how much debt can I qualify for” with a wish to have less debt. Many have now seen the slavery of debt and they didn’t like what they saw. Perhaps after 2024 the economists will be able to stimulate the majority’s “animal spirits” again. The question is: can this financial system, which depends on the constant growth of debt, survive through 2024 with people not wanting more and more debt? I decided quite some time ago that the answer is no and persistently take those pleasant actions that ready a person for financial system collapse. I take the influence of this Pluto “big switch” as a small but important part of the energetic change bringing us the long-awaited Transition. Thanks to Manfred Zimmel for permission to reprint this excellent piece of research. This entry was posted in Financial System, Transition and tagged astrology, banksters, central banks, Cycles, financial system disintegration, Manfred Zimmel, money printing, real estate, www.amanita.at by Thundering Heard. Bookmark the permalink.